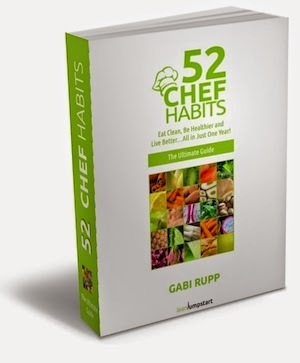 “52 Chef Habits,” by certified coach, author, and entrepeneur Gabi Rupp, is an absolutely a must-have for anyone who is looking to change their life by adjusting their habits. The authorhas created a weekly habit planner that each week provides a way to change the reader’s lifestyle in terms of eating, fitness, or overall happiness. The page set-up is very helpful for following your healthy habit routine. On one side of the page there are simple, easy steps to helping incorporate change, ideas for how to reward oneself after completion of the change, and ideas for triggers (which remind the reader to follow through with the change). On the next page will be space for the week where you can write down your own rewards and triggers, a quote that applies to the change, space for a meal plan, as well as the date for which you instilled your change. There is one new change for each of the 52 weeks. The idea of the book is simple: introduce small, doable changes into your life that you are able to keep and full-fill for the long-term. The little changes, added up over time, will result in a noticeable difference in one’s life. None of the changes are drastic, nor do they cost copious amounts of money. They can be used by anyone and everyone who is seeking guidance in becoming healthier and happier. Some of the changes include practicing meditation, developing a positive attitude, cutting out shopping, drinking green tea, motivating your kids for clean eating, getting more sleep, stopping emotional eating, and simplifying meal planning. Although everyone knows what they should be doing to be healthy, it can be difficult putting the ideas into motion. With this book, I was able to get the motivation and accountability I needed to be incorporating these changes into my life. Definitely a book that will benefit anyone looking to eat clean in an approachable manner!